Smart tips and suggestions for Australia visitors. Advices for the best restaurants and accommodations alternatives and attractions of the city are listed. Think about a land, isolated from the chaos of the world and offering anything that the whole world cannot give you. The deep heritage, a rich culture, heavenly natural life, beautiful beaches with fabulous ocean waves and spectacular cities are all await you in Australia. This is the paradise on earth with 40000 years of heritage and boasts establishing an environment that is based on respect and toleration for its cosmopolitan residents. This country remains as a holiday territory both with its fascinating cities or oxygen resource rural areas and tropical weather. Witness the cuteness of the famous kangaroos in national parks, walk in the rainforests, and surf in the crazy waves or live a modern city life in Sydney, Melbourne or the capital, Canberra. The famous harbour city Sydney whose symbol is the Opera House both gives you the essence of urban life and the peace of the summertime. The other most populated city in Australia, Melbourne is the center of arts and cultural activities. You can drink your wine by the Yarra River in Melbourne or let your body taste the salt of the ocean in gorgeous beaches. Pacific Ocean is also more blue in Gold Coast. People of Australia enjoys living in one of the most livable country in the world and therefore they are energetic and peaceful. Get ready for a nice welcome by happy and warm-blooded people. You are about to visit a country in this world but does not actually seem to belong here. Being an island, continent and a country, Australia is located in the Southern Hemisphere between the Indian and the South Pacific Oceans. The capital city is Canberra. 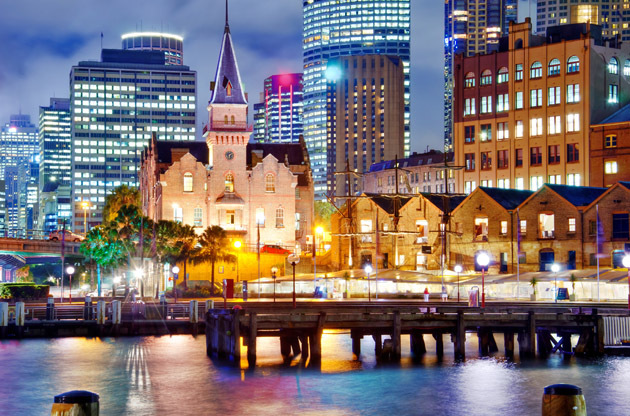 When you have the chance to be in Australia, it will be of course advantageous to see Sydney the harbor city with gorgeous beaches, or the capital city Canberra, Brisbane the subtropical town or Melbourne the cultural and artistic center of Australia. Still, there are some activities out of these cities that will make you feel you are really in Australia. Originally sat the depth of a sea and standing 348 m above the ground today, Ayers Rock is the most fascinating landmark in Australia. It is on the west of the Simpson Desert. Being in Australia means being in the pure nature. Being occupied nearly for 40000 years by Aborigins, Kakadu National Park offers the richest fauna and flora diversity. Discover the lost world, 30000 years of heritage. The Tarkine is the Australia’s largest temperate rainforest. If you have the chance to extend your trip and if you are curious about Aboriginal life, Northern Aboriginal Tour will give you the essence of their lifestyle. Surfing is one of the most popular sports in Australia. If it is the season, and you have the courage, you can even try yourself in surfing or be contented with just watching. Myer and David Jones are the biggest shopping mall chains in Australia. In the weekdays, it is hard to find an open store after 17:30. However on Thursdays and Fridays this time is a bit flexible. In Australian cuisine meat dishes and seafood play an important role and barbecue can be regarded as a tradition. Spices from all over the world are used in many recipes. Australia is mostly rich in shrimp and oyster. The most popular fish in Australian cuisine is the goatfish. John Dory, St Peter and St Pierre are the other popular fish species from the northern shores. Wattleseed that is a local spice is used in almost every recipe in Australian cuisine. In addition, the best ginger in the world grows in Australia. Thanks to its climate, Australia is the heaven for tropical fruits. Guava, mango and avocado are the most popular ones in this country where over 200 different kinds of fruit grow. Having 820 square kilometers of vineyards, Australia is the world’s 4th biggest wine exporter. Although the country has no native grapes, Merlot, Cabernet Sauvignon and Shiraz are the major grape varieties. You should apply Electronic Travel Authority (ETA) for business visitor activities. For the detailed information about ETA, you can visit the official site of Australian government. Being both a continent and an island, Australia is a distant but a very central hub for international meetings. High standards of living, grown economy and beautiful nature are among the reasons which make Australia is convenient for events like congresses, fairs, symposiums, conferences and tradeshows. The capital city Canberra, Melbourne or Sydney has the capacity to organize even large scale events perfectly. Stunning venues and hotels, developed infrastructure and the developed transportation options add up to Australia’s ability to host the leading national and international events in their sectors.